On November 30 the group Greek Isaiah in a Year read the last verses of Isaiah 66. And what a rewarding experience it was to read slowly–over the course of a (church) calendar year–through Isaiah. Blogger Brian Davidson wants to do it again. I’m going to be following the Facebook group (here, where all the action will be), but am not sure I can do the whole thing again in a year. We’ll see. But if you started last time and didn’t finish, or are looking for a way to sharpen your Greek this coming calendar year, check it out. At this time last year I was still in first-year Greek. Not only that, but you were almost halfway through when I found out about it! I’m totally on board for the next run-through! Just a note: if we are doing it again, it would be nice if we could see all your posts on Isaiah from this year so we can reference them as we go through again on facebook. Glad you may be able to do it this year! 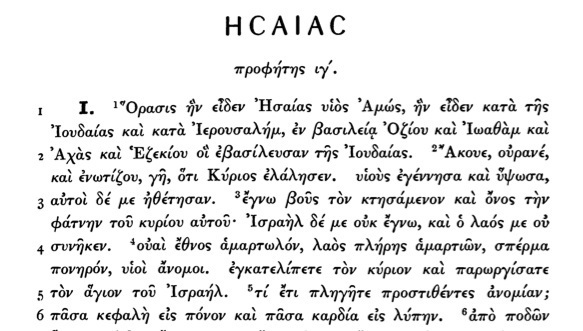 Being (a) poetry and (b) Septuagint Greek, I found Isaiah to be notably harder than reading, for example, New Testament narrative. But well worth the effort.